Our esteemed NEHU declared the B.A on July 20, 2018 at night and the last date for submission of forms for Masters Degree is July 23, 2018. July 21& 22 were weekends (Saturday & Sunday). On this basis we would like to express our grievances at this lack of sensitivity of NEHU. It will be a tough task for us to do the same in just one day (especially the rural students living in far flung areas). We want to inform you that most of the students from rural areas cannot apply online as mobile connectivity is extremely poor and not all of us have computers. We therefore beg and pray that NEHU will extend the last date of submission of forms. The recent development in the KHADC has very little hope to offer our state. In fact it is questionable if the KHADC has anything at all to offer. Ever since the time that these members were elected, the only thing that stands exposed is the kind of immature and self-centered leaders that our State has produced, particularly among the Khasi and Jaintia people. I might be wrong and might even be accused ofn overstepping my limits but it seems that when it comes to leadership, firstly the disease of not wanting other people to succeed is so deeply rooted in our culture that any hope of any good being done seems completely out of reach. Secondly, the desire to promote the self is so strong that all good causes have simply had to suffer the consequences of never being accomplished. Thirdly, the desire to make one self rich is so embedded in our DNA that any schemes or benefits that should have been made available to the public have unashamedly been leaked out from the bucket. The present situation indicates that we now have a leader in the KHADC, who has managed to change more parties within a span of just one year than some of us would have managed to change our clothes in a week. This takes me to the fourth point that if we have people who cannot even be loyal to a party through which they have been elected then what guarantee can they give that they will be loyal to the cause for which they have been elected? As long as individuals are larger than the cause, we will all have to be content to sit down, relax and simply choose to enjoy watching this vicious cycle. Is it not true that if we repeatedly watch a bad show and even more so if it’s the only show, then somehow after sometime it starts to become enjoyable. I guess if a name could be given to this disease it should be called, ” The I disease”. Will the Govt show concern for the disabled? Your report of July 10 on Meghalaya’s request to the NEC for finance mentioned the opening of a school for the Children with Special needs. Thank you, Mr. Chief Minister, for your concern for the disabled. It came to me as a surprise – a very pleasant one indeed. 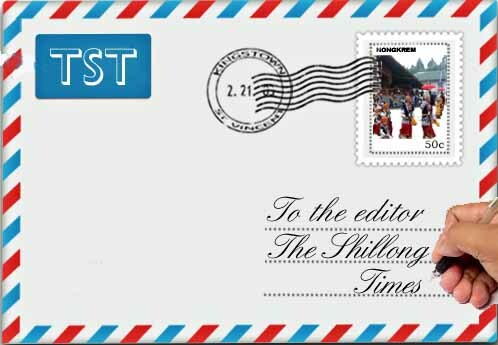 It took me back nearly seventeen years when the Department of Education, Government of Meghalaya by its letter No. RC/PER/EDUCATION/2000/25 of October 27, 2000 had proposed a School for the disabled. Nothing concrete happened since then. The Government after discussing the proposal with us realised the necessity of qualified dedicated Special Educators and the high cost of running a Special School. I now sincerely hope that the State does open a School for children with Special Needs and that it alternatively also subsidises the existing Special Schools by paying a reasonable amount towards the salaries of the Special Educators to enable them a decent life. As per the Central Government’s Scheme under the DDRS a Special Educator gets Rs. 6,900 (Seventy five percent) Rs. 5,175 per month. But even this peanut of a salary arrives after nearly three years. Dwar Jingkyrmen is not able to meet the demands for admission due to the non-availability of accommodation hence further construction of additional class rooms is proposed. This will entail an expenditure of Rs.12 lakhs. Will the State Government help to meet this genuine expense to help its own children? . The traffic problem of Upper Shillong seems insurmountable with traffic jams starting as early as 8 in the morning but what really amazes me is the mysterious nature of the traffic. No one knows where it starts or where it ends; no one knows why it starts. There are no big trucks or road constructions or accidents taking place that can be said to cause the traffic jam but it’s just the vehicles only. You’ll be stuck in the same place for 30-45 minutes and the next things is that the road will be as free as a bandh day. The presence of Traffic Cops at 3rd mile, Upper Shillong doesn’t help ease the traffic but creates more problems instead. It seems like the cops aren’t trained enough on how to handle traffic. In fact it seems like the drivers know better than the cops on how to handle traffic. The daily traffic jam is creating a lot of problems for people of all walks of life, especially the students. The concerned authorities need to take a hard look at the traffic problem. The Government too should do something about the increasing numbers of cars even while the size of the road is still the same. We should be attracted to listen to parliamentary debates to make our democracy more meaningful. The most Sacred Temple of democratic India ought to be our Parliament and the most Holy Book should undoubtedly be our Constitution. Unfortunately, we tend to forget that democracy cannot survive without healthy parliamentary debates. Such debates and discussions are necessary not only to make the electorate politically conscious but also to make the Members of Parliament accountable to the voters. The debate on no-confidence motion in the Parliament along with its live telecast has generated interest among the electorate. Such interest is a must for the vivacity of our democracy. This monsoon session of Parliament has brought a refreshing drizzle after days of drought in vox pop in our Parliament. But this drizzle could have been turned into a much needed rain for two consecutive days. It would be better if two days had been allotted instead of a single day for the debate on no-confidence motion as there were instances of Parliament sitting on Saturdays. WILL OPPOSITION UNITE BEHIND RAHUL GANDHI?